Notes | Dirck Halstead is one of America's preeminent photojournalists, whose iconic images have graced more covers of Time magazine than any other photographer's. From the battlefields of Vietnam to the halls of the White House to film sets around the world, Halstead's sense of timing and eye for the revealing shot was unerring throughout his 50-year career. Among the 300 photographs in this collection are many that are instantly recognizable, such as Bill Clinton embracing Monica Lewinsky, or Nixon saluting with his famous V-for-victory sign. Others have become more resonant with the passage of time. Throughout, Halstead provides fast-paced, lively, and engaging accounts of his experiences in the field. 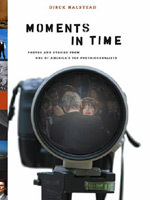 A one-of-a-kind autobiography in words and pictures, Moments in Time is a half-century of history seen through one photographer’s lens. Dirck Halstead's photos have won every major prize in the industry, including the Robert Capa gold medal and two Eisies. He is currently a senior fellow in photojournalism at the Center for American History at the University of Texas, and he runs the award-winning webzine the Digital Journalist. Halstead lives in Austin, TX. Comments | [05/25/07] Got it for 1o.5o as well from amazon. Outstanding book and great stories. One of those books you pick up and suddenly its two hours later and you are wondering where the hell your time went. Comments | [05/16/07] As of this writing, this book is only $10.50 on Amazon. Get a copy at this price while you can, it is outstanding!